“Rampage,” inspired by the 1986 arcade game of the same name, will be roaring into theaters this week, Friday, April 13 with hopes of destroying the box office. 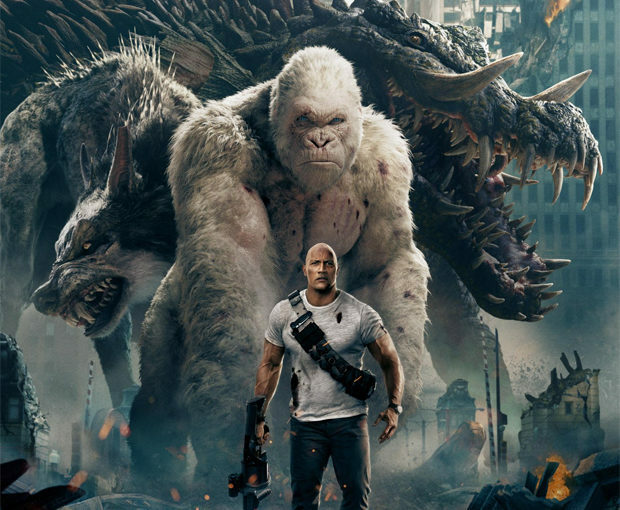 “Rampage” is about primatologist Davis Okoye (Dwayne “The Rock” Johnson) and his relationship with a super-intelligent albino silver back gorilla named George, who Okoye has taken care of since he was born. After a strange looking object falls from the sky (it looks more like something a human built rather than aliens), a mysterious infection appears on George’s chest. George grows to a massive size and starts upon a terrific path of destruction. George is not the only monster that will be making its way on to the big screen, however. Shortly after George starts his rampage (wink, wink), two more monsters appear to leave their mark on the world. One of these monsters is huge gray wolf named Ralph, who can jump really high and has wings to help him glide down from great heights. The other monster is Lizzie, who is basically a super-sized American crocodile on steroids with tusks and a bat like tail and easily the largest member of the terrible trio. The three monsters will, hopefully, be making a mess of North America and the cities in it for a good portion of the movie. To not only stop the three monsters and their destructive nature, but to potentially save George, Davis will team up with genetic engineer Dr. Kate Caldwell (Naomie Harris) to save America and find out whomever is responsible for mutating the creatures and why they did it.